The 18-hole course extends along the valley of the Moors River, it covers a total of 6337 yards and includes four par 5s, ten par 4s and four par 3s. 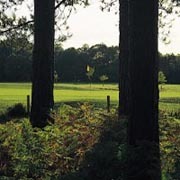 As well as the 18-hole course there is a four-hole pitch and putt course with holes ranging from 35 to 70 yards. Other practice facilities include practice nets, chipping and putting greens.